Check out my latest interview on BBC Radio Northampton! Helen Blaby (presenter) and I chatted blogs and reading. Thanks Helen, for having me on air! Have you checked out my travel blog? It turned one year old in January 2014 and it's been a huge success, judging by the page view, retweets and comments left by readers! Take a look at Born To Be A Tourist now! If you fancy guest blogging for me sometime, drop me a line on Facebook or on Twitter. I'm now on Google+ - yet another social network! I've signed up for SEO reasons mainly, but I'd love it if some of my fellow writers came by to say hi! Running Out Of Ink magazine have published my short story 'A Frosty Reception' in their new issue. What a fantastic beginning to 2013! Take a look at issue three - I'm the final act on the bill. In my day job as a Recycling Officer, I've written for the local press this month. Take a look at the Christmas recycling article I wrote here. "Think twice this Christmas, before you throw all your cards, wrapping paper and boxes into the bin. Recycling it is an easy and environmentally friendly way to help your household have the greenest Christmas yet." Running Out Of Ink - publishing success! Thursday 1st November 2012: One of my short stories has made it into the inaugural issue of RUNNING OUT OF INK magazine! 'An Empty House' was written off the back of a prompt exercise I participated in a few weeks ago with Cake ShortAndSweet - one of their 'Wednesday Write-Ins' (#wednesdaywritein). This was week 4, and I'd finally found my flow apparently! Having such good feedback from fellow writers, I sent it off to Running Out Of Ink, who quickly accepted it for publication. Hooray! 'Running Out Of Ink' is a fiction webzine, launched this week. You can follow them on Twitter. They are looking for more writers who wish to submit, so take a look! Also, check out Wednesday Write-In; the prompt-based competition doesn't offer prizes but kudos for winning is enough to encourage more and more entries each week. As you may have seen from a recent blog entry, I entered a Halloween competition this week (24th October 2012). This was an app based creative spooktacular run by Ether Books Ltd. Readers were asked to download stories from the app and the story with the most downloads after a week won an iPad. 'Dawn of the Diners', my first ever Halloween piece, and it placed 5th out of 64 entries. I was 3rd for a long while, but unfortunately did not win the overall downloads competition. Ether Books have short stories available all year round from published and new writers. They're simply a click away, each story being free of charge to download. You can download the app now (free! ), but unfortunately the Halloween competition closed at midday on 31st October. 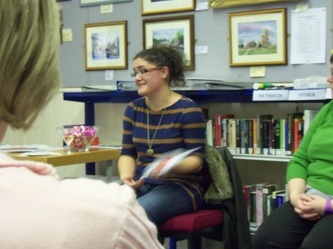 On October 13th 2012 I popped along to the Norwich Writers' Centre, Princes Street, Norwich, to join the team of writers wanting to learn "How To Plot Your Novel". The day was led by author Alex Preston and covered all sorts of tips and pointers on how to progress with your novel, while keeping the up the pace and maintaining reader interest. Although the views I have of how the day was delivered are not extremely flattering ("I'm basically the literary equivalent of Bono playing Wembley by being here today..."), Norwich Writers' Centre itself didn't put a foot wrong. The venue is modern, comfortable, and a great environment for literary types. A walk through the town at lunch only helped with this, surrounded by history, cobbled streets, independent shops, local events - the most random of which I found was a postcard fair - cafes and churches. I would thoroughly recommend having a look at what's on up there if you're local, but do be careful with local parking. Using the Monastery car park (as recommended) cost me £15, so shop about! This course ran 10-4pm with an hour's lunch, and entry fee was £50. Tea and coffee was provided but we had to bring our own lunch. Find the Norwich Writers' Centre on Twitter, or take a look at their events pages online to see what's coming up. Now I'm going to get cracking on finishing my second novel! I've just booked myself a ticket for an event at Derbyshires literary festival. I'm going to take part in Louise Doughty's workshop on Monday 14th May, Bolsover Library where we're going to work on developing plots for our novels. It's close to being sold-out at time of press, so should be a good event! To find out more about Derbyshire's literary festival, follow them @litfesttwitfest or check the brochure on their website. I've been invited by Waterstones (now without an apostrophe!) to make an appearance in store. How exciting... and nerve racking! I will be in the Midsummer Place branch of Waterstones in Central Milton Keynes on Saturday 28th April 2012. Come along and say hi, and grab yourself a copy of my book 'Girl Meets Boys' without paying the pesky postage on Amazon! 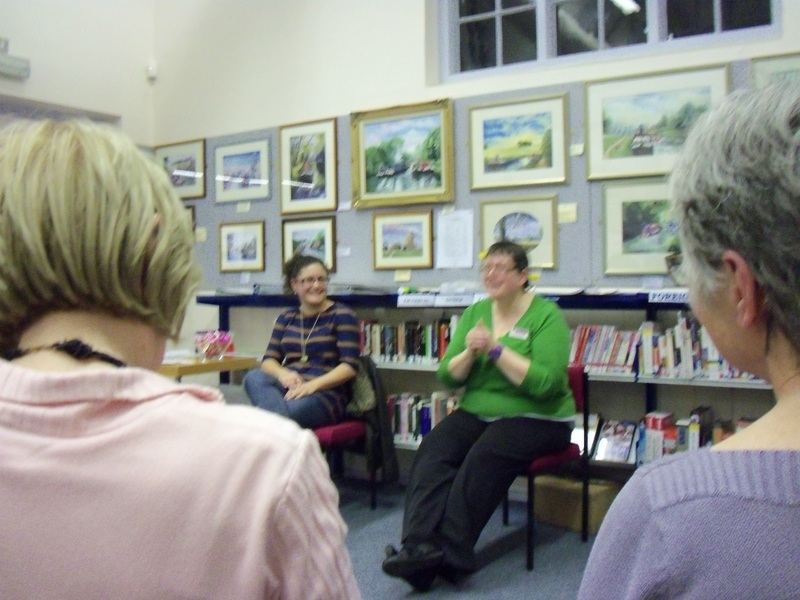 Gilly Tompkins and I organised our local World Book Night event on monday 23rd April. 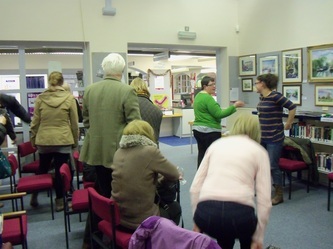 We had a great turn out to discuss as many of the 25 book set by WBN organisers as possible. We voted which book has inspired us to read it, and the one with the most people interested in trying it out was Sophie Kinsella's 'Dream World of a Shopaholic'. 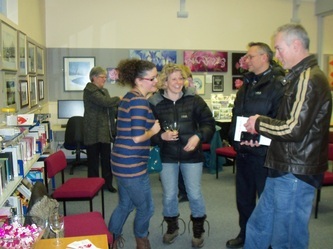 Thanks to the Library in Towcester for being our hosts for the evening. A great event - it gave me the kick I needed to finally read 'Rebecca' by Daphne Du Maurier! I'm raising money for Raleigh International tonight by hosting a charity pub quiz. Raleigh is an outreach charity who organise young people into projects to help with humanitarian and conservation needs in the developing world. I will be volunteering for them for 8 weeks in June, and tonight is about raising money for the charity. Get your quiz team together (max. 4 people) to the Rockin' Horse Pub in Towcester, Northants for 8pm tonight - entry is £3. There will be free chips for each team, a raffle, and lots of drinking to be done! 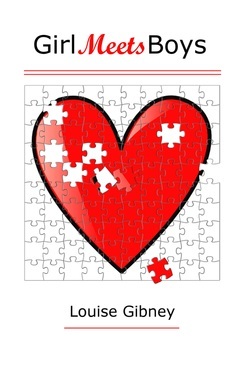 All profits from the sale of my internet age rom com book 'Girl Meets Boys' until end of April are being donated to Raleigh International, so now's a great time to buy! World Books Day trended on Twitter, it made kids dress up as characters from their favourite books, and libraries grabbed the opportunity with both hands to promote reading. Of course, I got involved! This year, BBC Radio Northampton approached me and asked if they could feature one of my short stories on air in celebration of WBD (hashtag!). They wanted to have my tube journey story 'Catching a Stranger's Eye' read on air on the afternoon show on World Book Day. Of course, I said yes, and several of the radio staff recorded parts for the broadcast on 1st March 2012. The broadcast was very well received by listeners and the staff themselves, and I am very grateful to all at BBC Northampton for helping spread my writing around the County. The iPlayer link has expired now, but you will be able to listen to the broadcast very soon on my Sound Cloud pages. 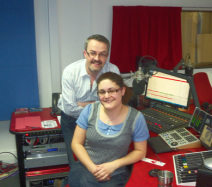 Radio Presenter, John Griff, interviewed me about my internet age romantic comedy novel 'Girl Meets Boys'. All of the profits from sales of my debut novel until April 2012 are being donated to Raleigh International. This charity takes young adults from all sorts of backgrounds out into developing countries (e.g. Borneo, India) to work on humanitarian and conservation projects, and is a charity I will be working for on expedition in Costa Rica in summer 2012. Thanks to Stony Stratford Library for hosting my 'meet the author' event in February. It was conveniently tiemd to tie in with Valentines Day, and everyone was in the mood to hear about the search for love (or not!). A smaller event than normal in terms of turn out, but I enjoyed meeting the Friends of the library and a lady who runs an online dating agency in Milton Keynes. We could share some stories, that was true! I also had the pleasure of seeing a couple of familiar faces from years gone by as well, which was lovely! A Book to Accompany Roses...? News Flash! - Valentines season 2012 only! From 10th February 2012, my internet age romcom 'Girl Meets Boys' will be in stock in the flower shop Miss Lillies, Towcester. You can find the shop on Watling Street in Towcester, or shop online on Lulu or Amazon. Grab your copy now - the perfect reminder that you're a better date than any others! 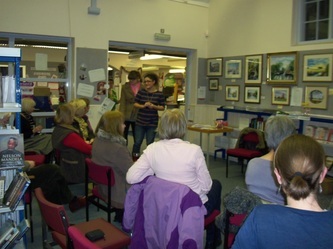 The Bodicea Book Club offered to read my book 'Girl Meets Boys' in December 2011. The club of about 10 avid readers meet monthly to discuss a wide variety of books, and they had some great questions about all the dating stories in the book when I visited to see what they thought of my debut novel. 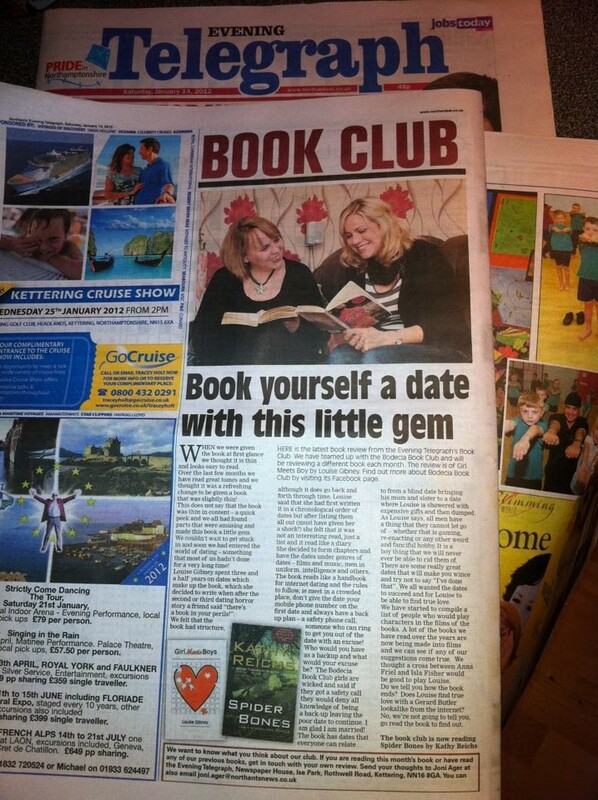 The club reviewed my book for Wellingborough's Evening Telegraph. Thanks to Jo Maddams for setting up the meeting and for the wonderful review. You can follow the Book Club on Twitter @BodeciaBookClub - you might find something new and exciting to read from their reviews! They also have a blog - Bodicea Book Club Thoughts. Secklow Sounds is a community radio station in Milton Keynes. One particular Producer, Nishil Solanki) is interested in 'spoken word' and named his Sunday evening show as such. You can find more information about Secklow Sounds and Spoken Words show on their Facebook pages. I was featured on air a couple of times reading a couple of chapters from my book 'Girl Meets Boys', and my competition winning story 'Catching a Stranger's Eye'. You can listen to one of the broadcasts via my Sound Cloud pages. My thanks to Nishil Solanki and to the Secklow Sounds team for allowing local writers and their literature to be broadcasted in Milton Keynes. I wish the station all the best with securing a permanent broadcasting license. My debut book 'Girl Meets Boys' is now on sale at Beautiful You, Brackley Road, Towcester. It's an internet age romcom, an ideal way to keep you in the great mood your facial or pedi put you in at the salon! Why not drop into the salon on Brackley Road to grab yourself a copy - and a little pampering too! Contact Beautiful You on 01327 358580 to book your appointment. This a radio interview I did regarding the charity anthology I put together in 2011. This was broadcast in the Spring of 2011, following the publication of my "Your Royal Wedding" anthology. This was a book I created to sell in aid of UNICEF, and was compiled from entries from a royal wedding themed creative writing competition I created. Thanks to Broadcast Journalist Briohny Williams (@queenbeedub) and Presenter Mark O'Donnell at BBC Wiltshire Sound for their help and support. On April 3rd 2011, I was interviewed about my debut novel 'Girl Meets Boys', a story of my search online for the perfect partner (unpublished at time of broadcast). The interview tied in nicely to the Royal Wedding related features Swindon based BBC Wiltshire were doing that fortnight, looking at romance and marriage as a theme. I was very nervous, and think I have improved my interviewing skills since! If you would like to book me for a 'Meet the Author' or other event, please use the form below, find me on Facebook, or Tweet me.